I originally shared this over at Claiming Our Space, but in case you missed it there, I’m re-posting it here! Breakfast is my favorite meal; I love pancakes, waffles, eggs, bacon, you name it! 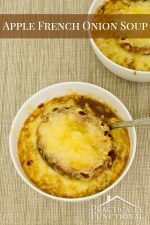 So I absolutely love quiche, and Quiche Lorraine (bacon and cheese) is the perfect combination of two fabulous breakfast foods. I’ve added a printable version of the recipe below. I had actually cooked a ham a week earlier, and we had TONS of leftovers. So I used about 1 1/2 cups of diced ham instead of the 12 slices of bacon listed above. Either way is totally delicious! 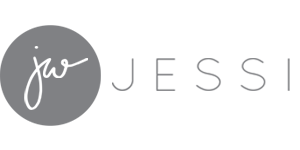 Start by preheating your oven to 425 degrees (F). Fry your bacon in a large skillet over medium-high heat until it is crisp. (If you’re using ham that is already cooked, you can skip this step, just make sure to dice it.) Drain the grease and chop the bacon coarsely. Put your pastry shell into a pie pan. At this point, also make sure your cheese is shredded and your onion is minced. 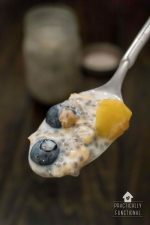 In a medium bowl, whisk together the eggs, cream, salt, sugar, and pepper. Once it’s well mixed, pour the mixture over the bacon etc. and into the pastry shell. Put the pie pan into the oven and bake for 15 minutes. Then reduce the heat to 300 degrees (F) and bake for 30 more minutes. If you stick a knife into the quiche an inch from the edge and it comes out clean, it’s done. If not, keep cooking it. The times on this aren’t super exact; you may need another 5-10 minutes to get your quiche fully cooked, especially if you use a glass pie pan like I did. Pull the quiche out and let it sit for 10 minutes before cutting it into wedges. This part is important; the quiche firms up during these 10 minutes and if you try to cut it right away it will totally fall apart on you! I was hungry so I didn’t let it sit for quite the full 10 minutes, which is why it’s falling apart a bit in this photo. But it was still delicious! 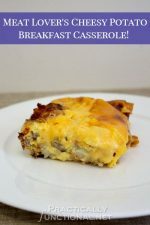 This bacon and cheese quiche is delicious and easy to make! Fry your bacon in a large skillet over medium-high heat until it is crisp. Drain the grease and chop the bacon coarsely. Put your pastry shell into a pie pan. Shred your cheese and mince your onion. 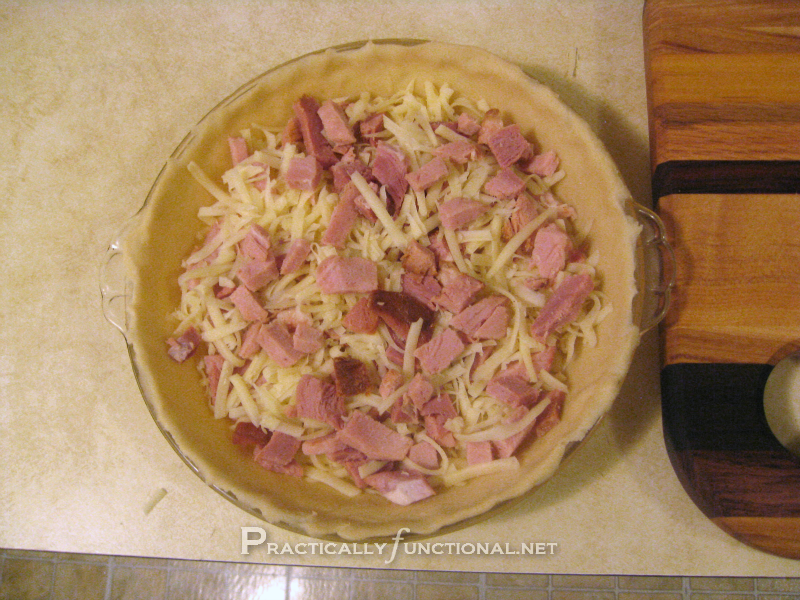 Sprinkle the bacon (or ham), cheese, and onion into your pastry shell. In a medium bowl, whisk together the eggs, cream, salt, sugar, and pepper. Pour the mixture over the bacon etc. and into the pastry shell. Put the pie pan into the oven and bake for 15 minutes. Reduce the heat to 300 degrees (F) and bake for 30 more minutes. 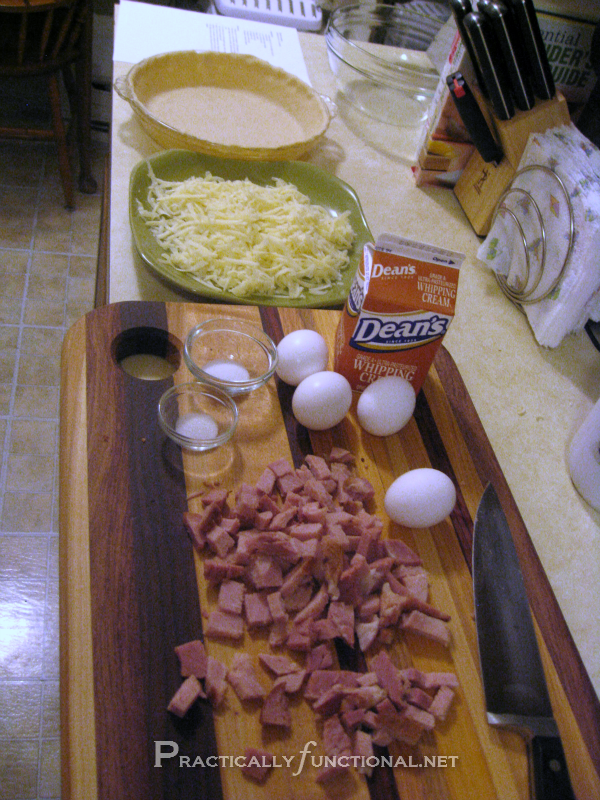 Test to see if it's done by sticking a knife into the quiche an inch from the edge. If and it comes out clean, it’s done. If not, keep cooking it. You may need another 5-10 minutes to get your quiche fully cooked. 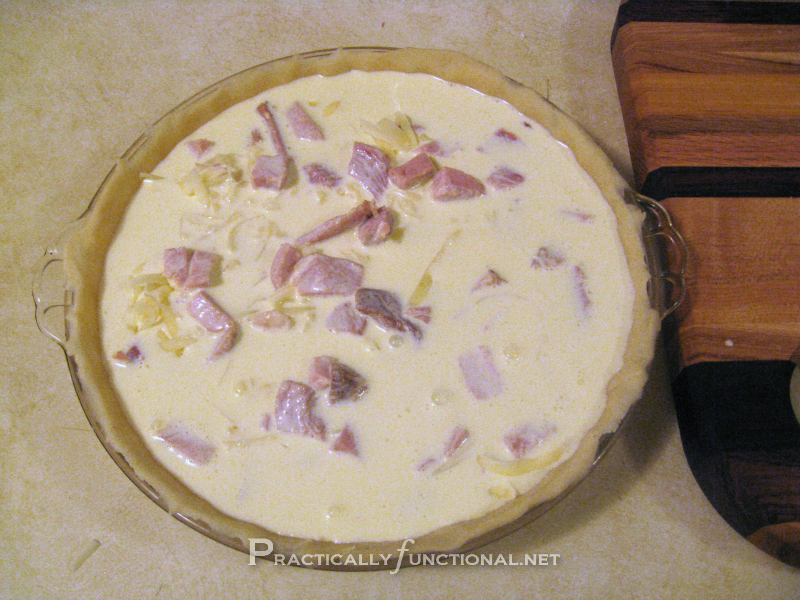 Pull the quiche out and let it sit for 10 minutes before cutting it into wedges so that it can firm up a bit. 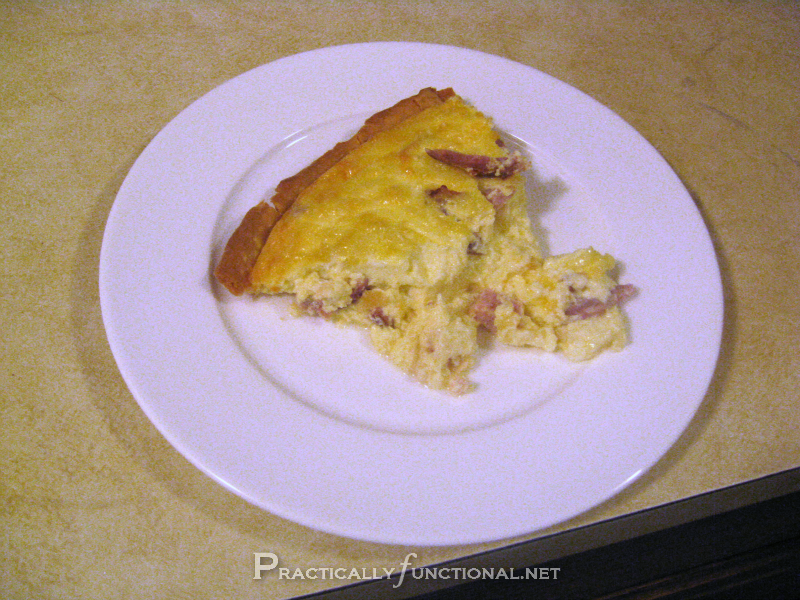 This quiche is also delicious with ham instead of bacon. Just substitute 1 1/2 C of diced, cooked ham for the 12 slices of bacon. I love love love breakfast! Especially since I have a source for local eggs that taste soooooo good! I have never made quiche, but as Im trying to get back on a more sugar/carb free way of eating I just might have to try one! I love quiche! I am pinning to try this weekend:) So sorry you have had so many tech issues lately. Not to worry I am standing by (sorry I can’t help with the tech issue, my computer skills are very much lacking) but as moral support:) Hang in there, kiddo! Haha, thanks Evelyn, I appreciate the moral support! 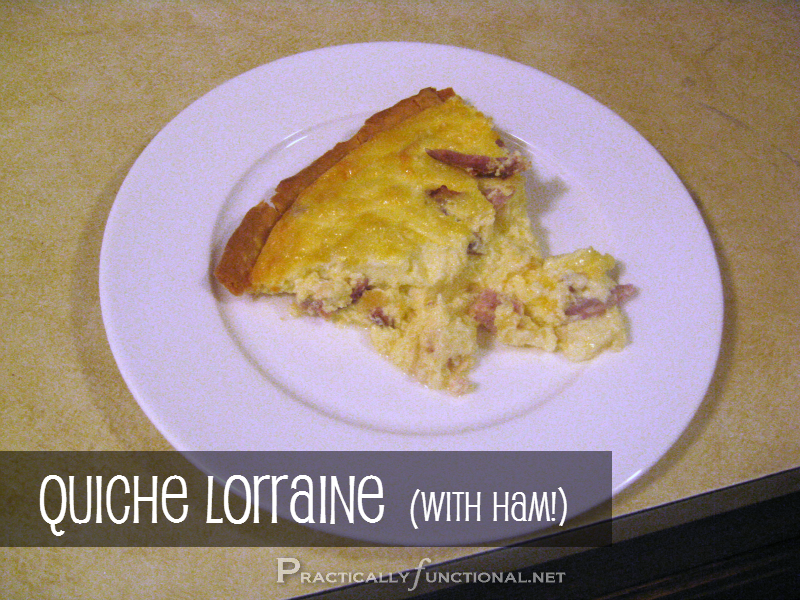 I love Quiche Lorraine! Looks delicious. Time to make some. Thanks for sharing! BTW Found you on Nifty Thrifty Things link party. So yummy! 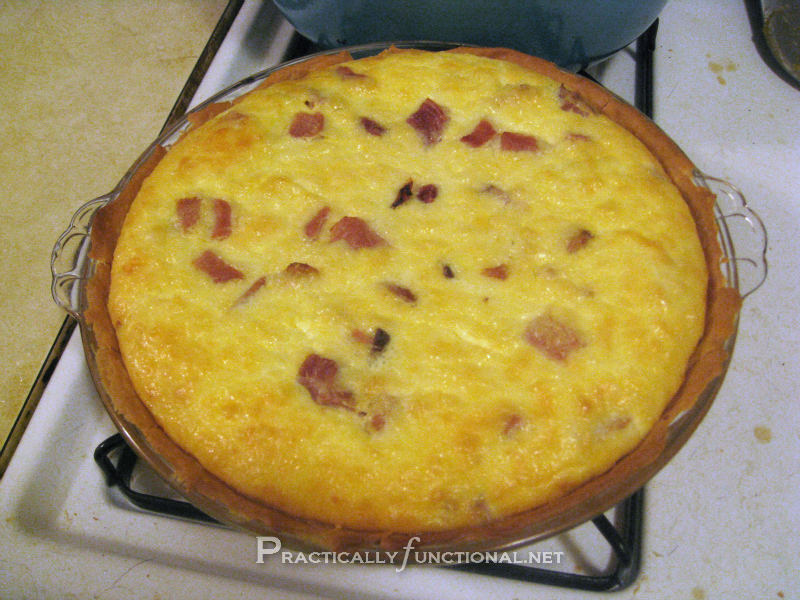 You had me at quiche…..
YUMMM. I just had this at a restaurant recently. 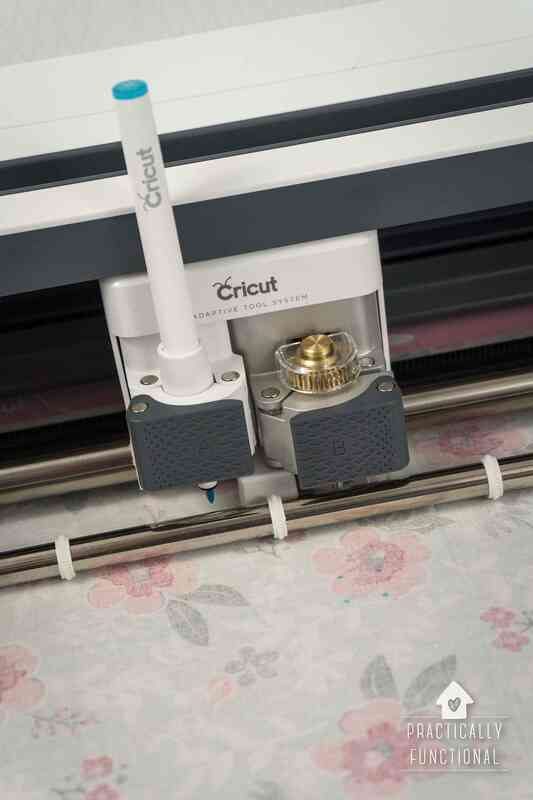 I need to make it myself! I would be honored if you linked this on my blog up at the Ginger Jamboree Link Party!! I love quiche too, though I usually serve it as a supper meal. 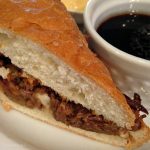 🙂 I like the way that I can add any fillings I like – bacon or broccoli or mushrooms or… Thanks for sharing your recipe! YUM!!! 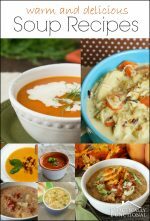 What I would do for some right now… COMFORT FOOD!! Looks really good!! I’m glad you linked up at Romance on a dime! !